Ninety-five percent of Americans rate water as “extremely important”, more than any other service they receive including electricity and heat, and nearly two-thirds are willing to pay more to ensure long-term access to clean water, according to an ITT water survey. 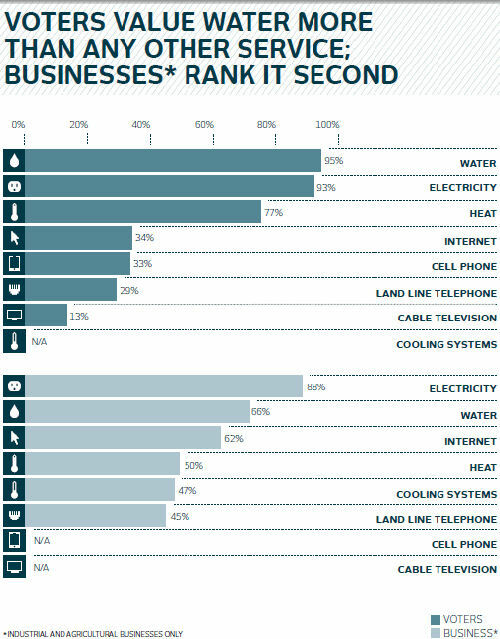 The survey also finds that industrial and agricultural businesses (66 percent) rank water as number two in importance, after electricity. Fifty-seven percent of business respondents are willing to pay a little more each month in water costs to upgrade the water system. The report, “Value of Water Survey,” based on a nationwide poll that included registered voters and industrial and agricultural businesses, measures how the public and these businesses value water and their level of awareness of the nation’s aging water infrastructure. The survey finds that nearly one in four American voters is “very concerned” about the state of the United States’ water infrastructure, compared to 68 percent of business survey respondents. Every day in America, 650 water mains break, or one every two minutes, says ITT. According to the U.S. Geological Survey, these breaks and other leaks result in the loss of roughly 1.7 trillion gallons of water every year, which is enough to supply water to 68 million Americans. The survey also reveals that 63 percent of all American voters are willing to pay an average of 11 percent more on their water bill each month to help ensure continued access to a consistent supply of clean water. When applied across all American households, this increase is equal to $5.4 billion or four times the FY2009 federal investment in the nation’s drinking water systems, according to the report. A majority of industrial and agricultural businesses surveyed also are willing to pay an average of 7 percent more per month for the water they consume. Most survey respondents also say that fixing the water infrastructure must be a national priority and is a shared responsibility among individuals, business and the government. Here’s the proof: 80 percent of voters say water infrastructure needs reform, with about 40 percent stating that “major reform” is necessary. In addition, 85 percent of voters and 83 percent of businesses agree that federal, state or local governments should invest money in upgrading water pipes and systems, and 79 percent of voters and 75 percent of industrial and agricultural businesses agree that government officials must spend more time addressing water issues. By one U.S. Geological Survey estimate, the value of lost water from water systems is $2.6 billion annually, along with 10 billion gallons of raw sewage released into waterways as a result of an insufficient water infrastructure, says ITT. The gap between what is needed to invest and what is actually invested in the nation’s water infrastructure is about $19 billion each year, according to the Congressional Budget Office, says ITT.